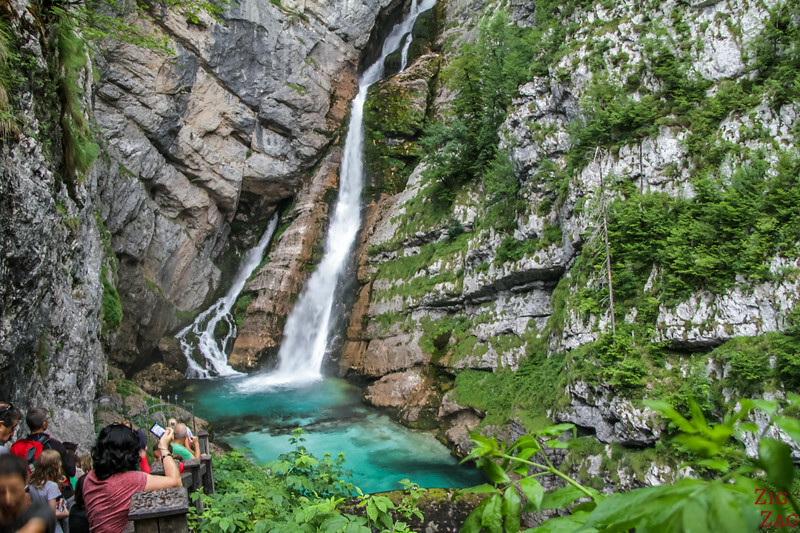 Slap Savica Waterfall is the most famous waterfall in Slovenia because of its unique A-shape and emerald pool. But to be able to admire it, you first have to climb more than 500 steps. Worth the climb I think. Below is my guide to help you plan your visit and walk. 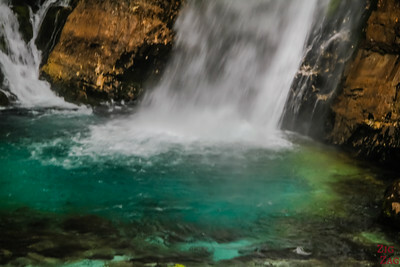 Why visit Slap Savica Slovenia? 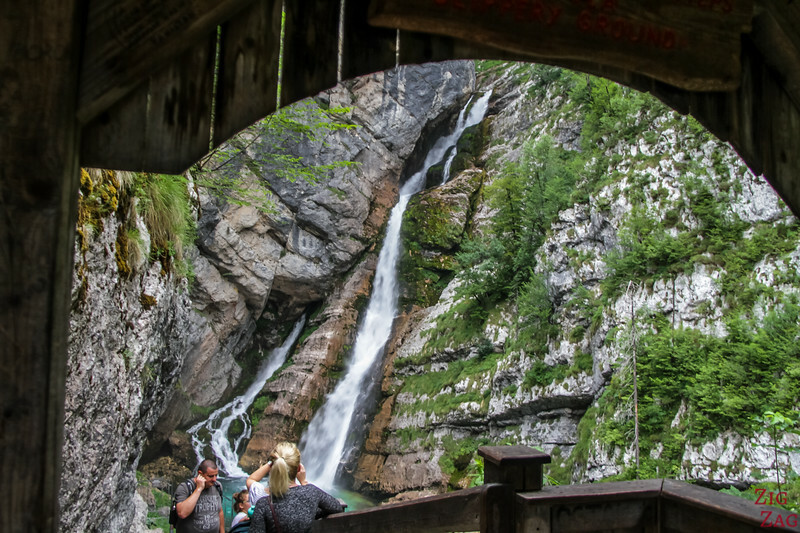 Before I share with your the details of the hike to the Savica waterfall, You might wand to know why this place is so loved and recommended by Slovene poeple. Well just have a look at the photo here. 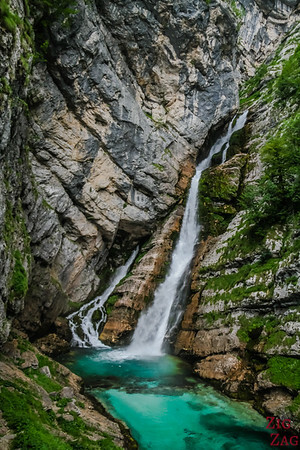 My opinion is that it is not the best waterfall in Slovenia. 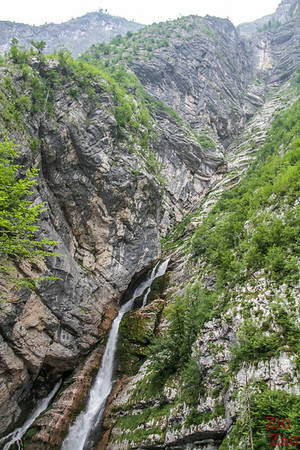 I personally really enjoyed Pericnik waterfall. 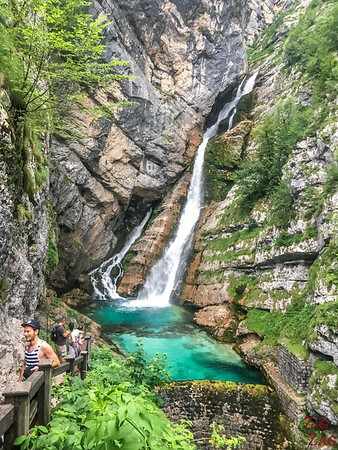 But it is definitively worth the hike if you are visiting Lake Bohinj. 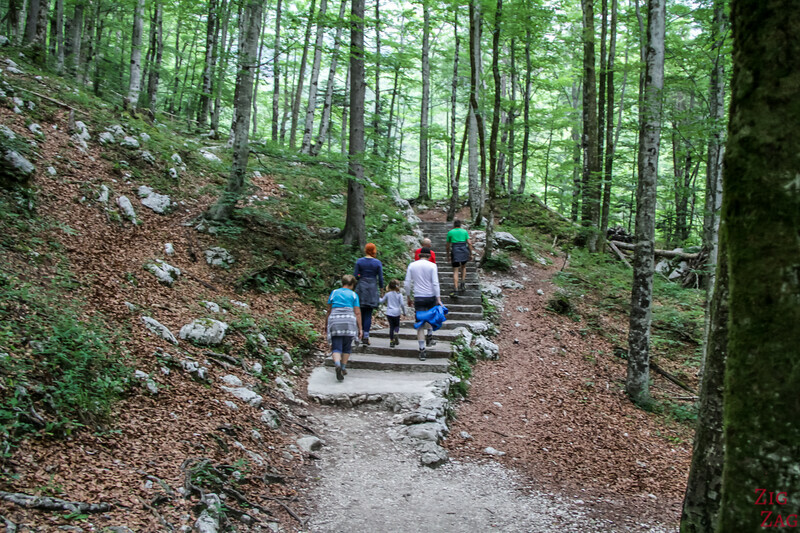 Is the climb to the Savica falls difficult? Well it is not an easy stroll in a park. 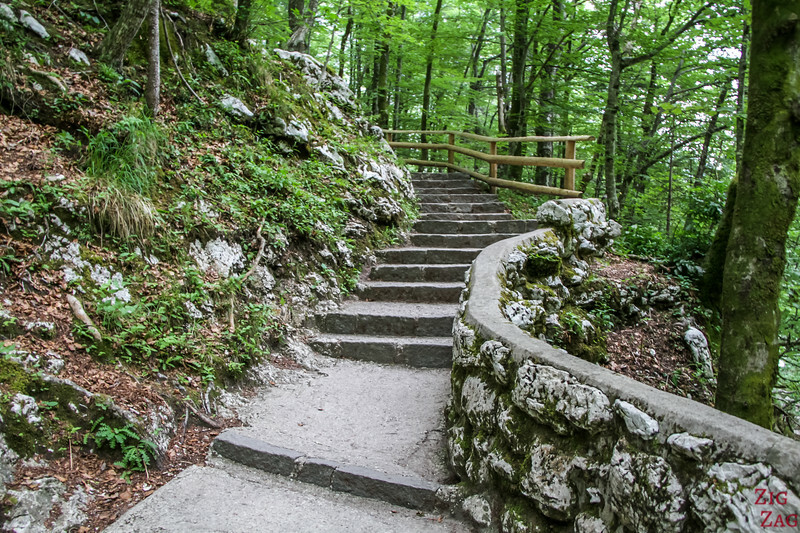 But the path is well maintained and the steps regular for the most part so it is not too difficult. How long does it take to walk to Slap Savica? At the end it took be roughly 25 min each way. I climbed well I think but I am not fit at all. 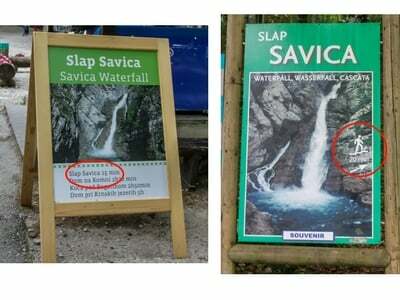 How many steps to to Slap Savica? This is a not a normal hiking path. They have build steps almost the whole way to the waterfall. They are well maintained and there is enough space to cross path with people going in the other direction. So that is great. There are 2 main stops on the way. After roughly 200 steps you get a view over the mountains and then end of Lake Bohinj (see next paragraph). And 100 steps later, there are picnic tables where you can sit to have a rest. The good news is that you are almost always under a dense forest. So if it is a hot day, the temperature is cooler here and if it is raining you get less wet under the trees. 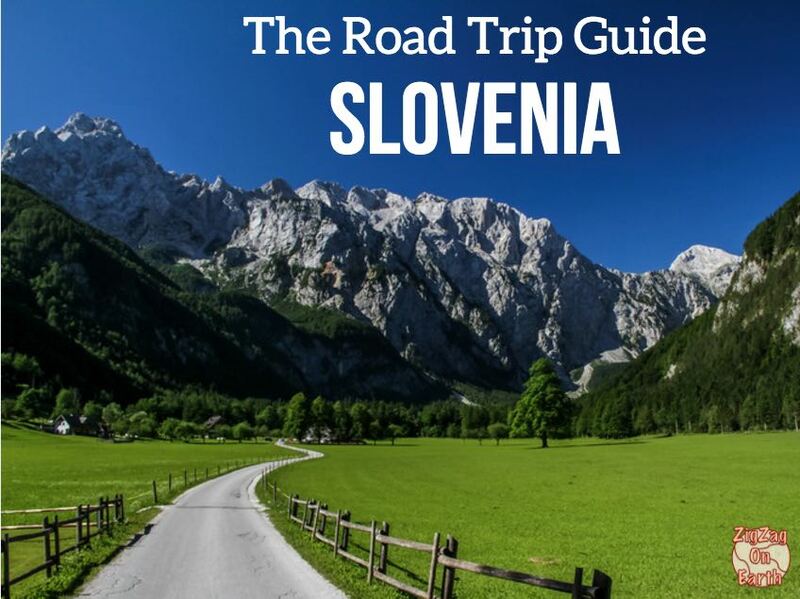 Savica, along with many other beautiful places, is included in my eBook: The Road Trip Guide-Slovenia. 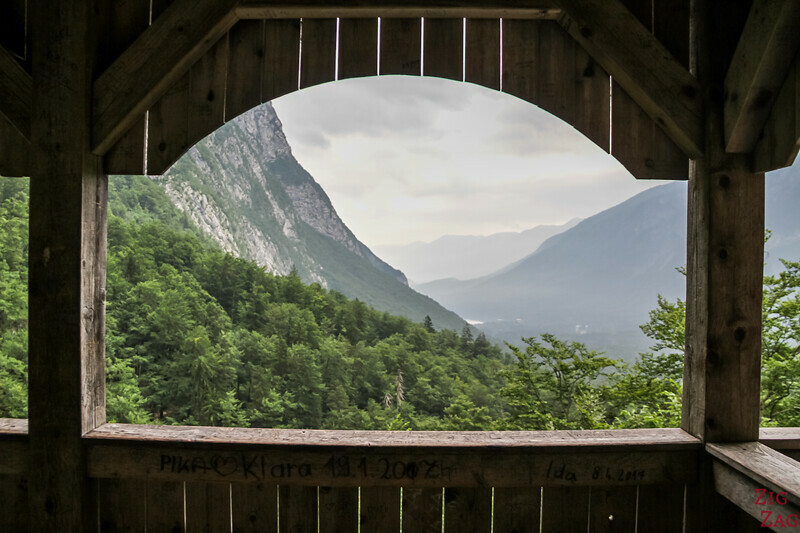 After 200 steps you get a clearing in the trees and get a glimpse at the Ukanc end of Lae Bohinj. 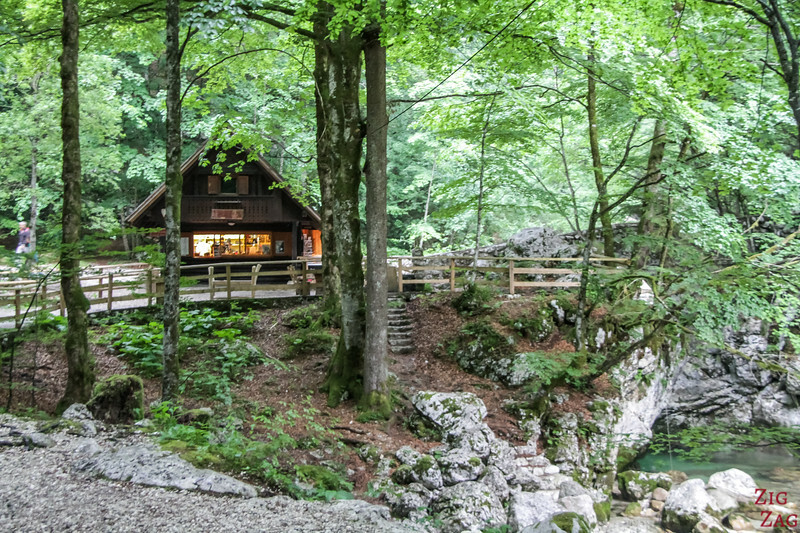 "Bohinj is an excellent example of typical Glacial Landscape. 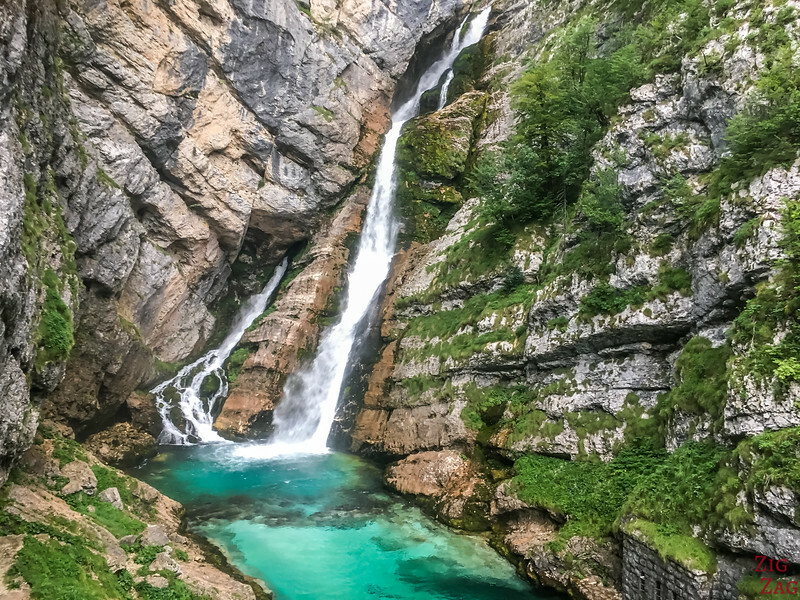 During the last glaciation 20,000 years ago, the Bohinj Glacier was the largest in Slovenia and was up to 1000m thick." 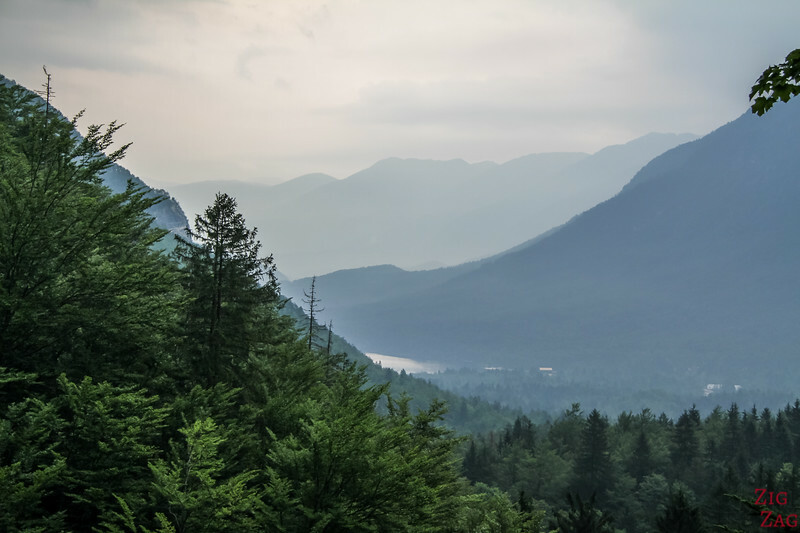 For your information, Lake Bohinj lies at 527m. At the top of the step is a small wooden platform. On one side you can see above the trees towards Lake Bohinj and the mountains once again. 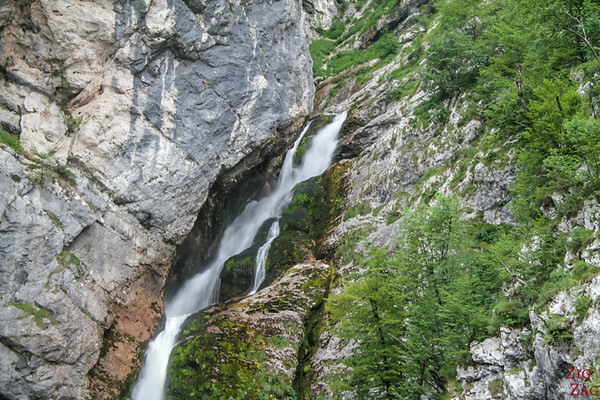 And on the other side you finally discover the magnificent Savica Waterfall. Once there, you can admire the waterfall from the top or get down a few stairs to get closer. If you don't visit early you might have to fight a little to get a spot on the right side of the stairs to take nice pictures (as you can see in the picture below). It is not so easy to get pictures without anyone on it. But you will see I got a few in the next paragraph. And here we are. 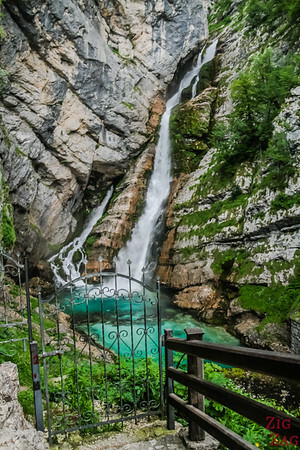 Certainly the most famous of the Slovenian waterfalls and the most visited! 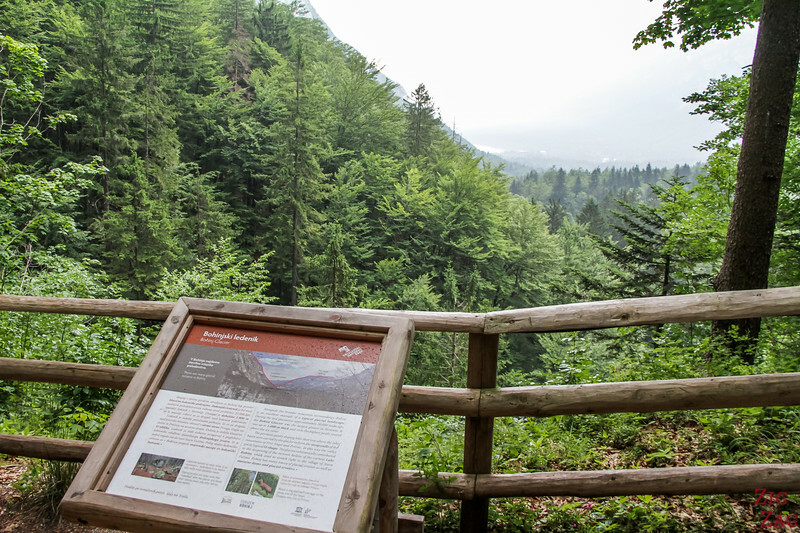 According the explanations on the path, its recognition is greatly due to the Slovenian Poet France Preseren who wrote The ﻿Baptism at the Savica. As you can see above, the water flows from the cave to a fault line in the Komarca rock wall. Inside the caves are lakes. The water of one of the lakes emerge as the lower fall. This one is 25m in height. And below is a short video to show you the waterfall in action and to prove it is the real color. I am sorry my filming was not very good, but it still gives you an idea of what is looks like. 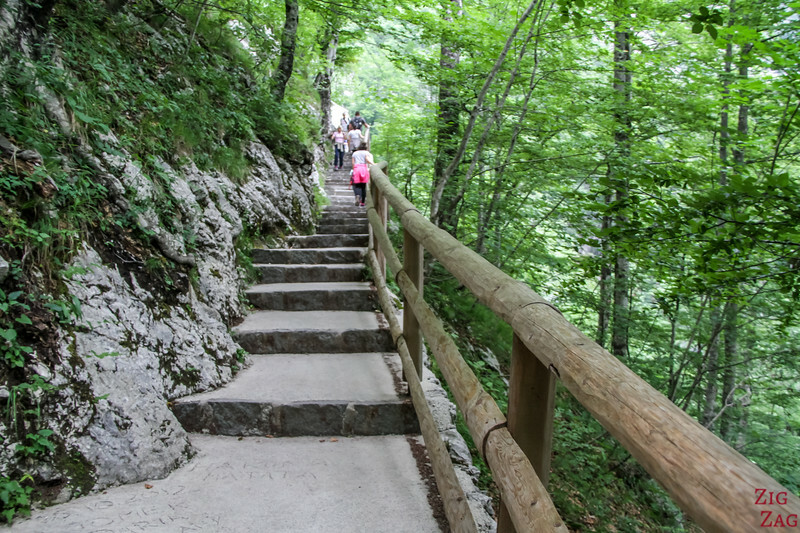 You can walk from Ukanc for 1h30 to reach the beginning of the Savica walk or you can drive to the Savica Parking. Be careful in case of bad weather. Path can be slippery. Do you think it is worth the 550 steps?